We all depend on the wonders of modern medicine to protect our health and extend our lives. The very process of practicing medicine, however, presents unique hazards. Medical safety gear, when used correctly, is very effective in protecting against these dangers, so it’s important that you understand what does what. Personal protective equipment (PPE) is safety gear designed to protect health care workers and patients from the spread of bacteria and germs. At its most basic, PPE simply puts a barrier between people and any contaminating germs. Basic gear: The simplest PPE, and the PPE you’ll most commonly see in medical situations, are gloves. These gloves can be made from latex, rubber, neoprene, or polyvinyl chloride, and they are lubricated or powdered to make them easier to put on. Although keep in mind that the FDA recently banned most types of powdered gloves. Masks are another important PPE. Some simply cover the mouth to prevent the wearer from spreading germs, while others include eye protection or make a tight seal around the mouth and nose to protect the wearer. Clothing: Other types of PPE include special clothing for various situations. 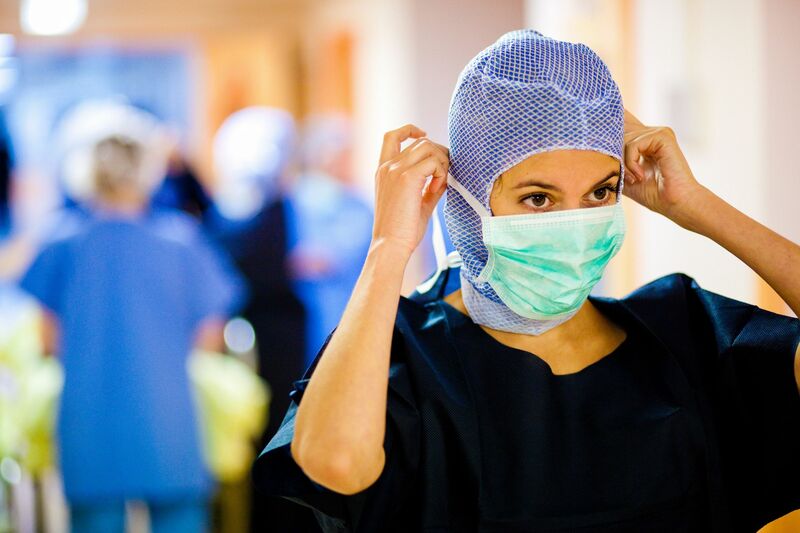 Gowns and head coverings protect patients and medical personnel during surgery. Shoe covers allow people to wear their shoes without tracking contaminants into a room. Special sleeves and cuffs, as well as goggles, protect medical personnel who are handling certain cytotoxic cancer treatment drugs. In the x-ray room, lead aprons, thyroid collars, and leaded glasses protect patients and personnel from unwanted exposure to radiation. Waste management: In medical situations, it is crucial to deal with waste safely and effectively. Medical waste can spread dangerous disease as well as things that are toxic to the environment or dangerous to others. Medical waste includes infectious and radioactive waste, chemicals, drugs, pathogenic waste, and sharp items like needles. Waste systems require special gear for storing waste, incinerators for safely getting rid of certain pathogens, and secure ways of transporting any waste which requires other methods of disposal. Infection control supplies: One step in preventing infection is personal protective equipment, but there are other types of gear that are crucial to keeping germs from spreading. These including spill-management kits, proper washing facilities for linens, and hand and eye-washing stations. In order for all this equipment to be effective, there must be protocols in place so that everyone knows how to use them effectively. Water quality: Water is crucial to many medical procedures and cleaning protocols, as well as necessary for drinking. Keeping water safe and getting the right water necessary for any procedure is one of the most important, and difficult, issues a medical facility faces. Special equipment to keep water safe includes storage tanks, kits for water testing, and facilities for storing used water. Water coming away from a medical facility must also be treated to ensure that chemical and biological contaminants pose no danger to the environment or to people. This means wastewater has to be treated and monitored before it goes to the sewer. Air filtering: The air in a medical facility must be treated in several ways. In many situations, particularly in surgery, it is essential that temperature and humidity levels are kept within certain limits. It’s also important that the air be changed out regularly to filter airborne contaminants. Medical air filtering equipment includes special pressure fans and filtration systems. The fans make sure that pressure keeps air where it is wanted, while HEPA and other filtration systems remove bacteria, viruses, and airborne pathogens. These are just a few of the essential types of medical safety gear necessary to keep hospitals and similar faculties operating smoothly and safely. No Replies to "Medical Safety Gear"